I've recently been admiring spiral quilting and decided this project was the right size for trying it out. Not a lot of bulk to get through the machine as I spin it around a million times. I marked the center circle by tracing a large Aurifil spool and used my walking foot from beginning to end. I am loving the Aurifil Marrakesh variegated thread (#3817, 50wt) that I bought to use on my son's quilt. I think the variegated thread helps to forgive the imperfections of my spiral quilting. (So will a good wash!) I used my walking foot guide and aimed for a 1/2" to 5/8" gap between stitching lines. Overall I am really happy with the look. My son and I agree that it's very fun to trace the spiral with our fingers. I'd love to try it on a larger project, perhaps with multiple spirals, but I think I'd shoot for spacing the stitching out more to speed things along. 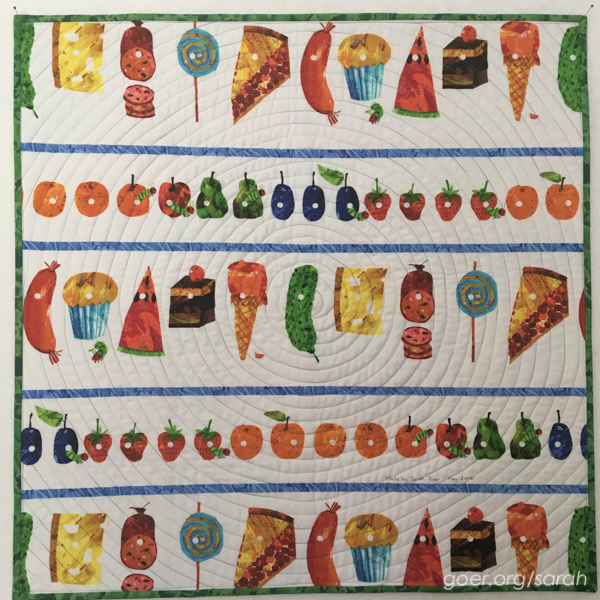 Have you spiral quilted? If so, walking foot or free motion? Are there any quilting motifs that you're itching to try? Thanks for visiting! I'm linking up to Finish it Up Friday, TGIFF and the Q2 FAL Finishes Linkup. See all my Q2 goals here. Posted in Quilting. 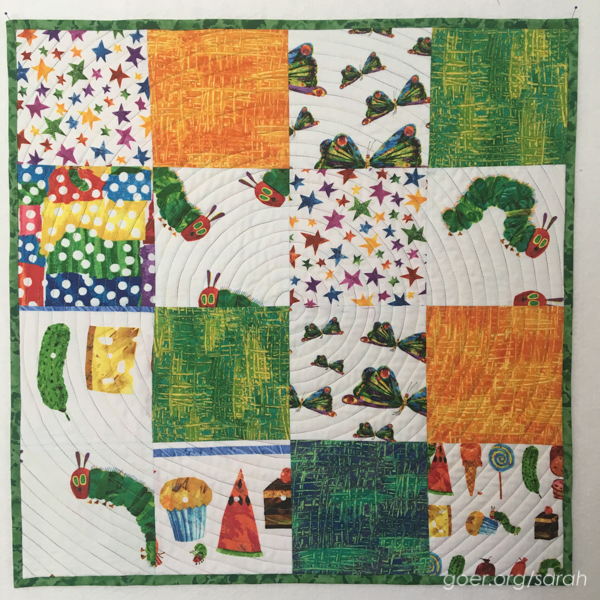 Tags: finished quilt, mini quilt, spiral quilting, Very Hungry Caterpillar on July 1, 2016 by sarah. 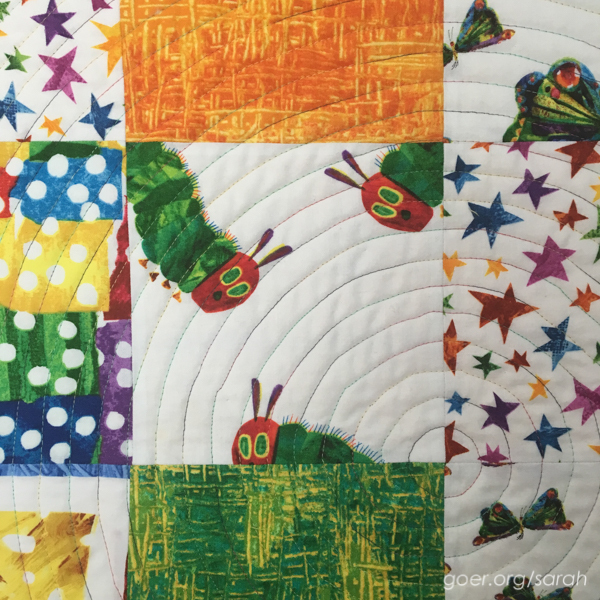 A great finish with that Hungry Caterpillar fabric, you have really done it proud! Your quilting is so beautiful! Thank you for linking to my tutorial. I love using my FMQ foot first and then walking foot, but it works differently for different people! Cute finish Sarah! I have spiral quilted once before with a walking foot and loved the result. It's definitely a quilting pattern I will try again. At the moment, I 'm trying to pluck up the courage and finally do some fmq on my quilts! It has been a while since I did spiral quilting, but I did it free motion style as I felt it was easier than trying to "smoosh" a quilt round and round. I agree that tracing a spiral is one of the best parts of this style of quilting! I agree that for a larger project free motion might be the way to go. My little machine has a 7" throat space, so I understand the struggle. ;-) Thanks for visiting, Yvonne. Lovely little quilt ☺I've done spiral quilting using a walking foot on a couple of bed quilts and done intersecting spirals on a table runner. For my latest project I quilted arcs starting with a small semicircle in one corner and then echoing it across the quilt. Finding quilting curves with a walking foot to be very effective. Thank you, Allison. I've clearly been underutilizing my walking foot. 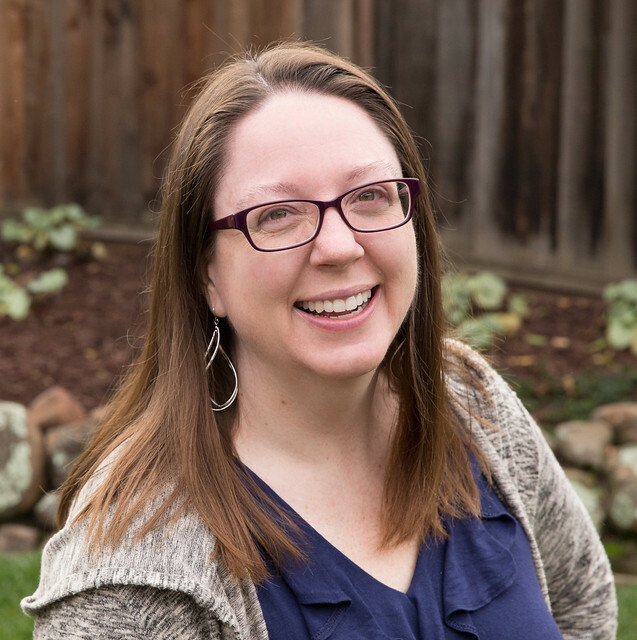 Have you checked out what Leah Day has been doing with a walking foot? I know she's been using one, but I haven't checked it out myself yet. I love her free motion stuff! I love spiral quilting and the impact it makes on the finished quilt! I use a walking foot because I like the evenness it creates. Congratulations on the finish and thank you for participating in the 2016FAL, on behalf of all the hosts! Hi Sarah, I love the fabric, your quilt is a treasure.